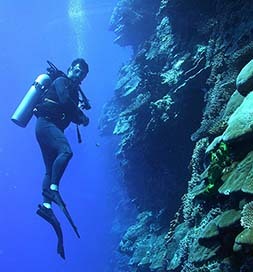 Each year, the NOAA Coral Reef Conservation Program publishes federal funding opportunities on www.Grants.gov to solicit proposals for coral reef conservation activities. Based on Congressional guidance in the Coral Reef Conservation Act of 2000 et seq., we strive to issue at least $8 million per year in matching grants and cooperative agreements, which are awarded to nonprofit organizations, academic institutions, regional fishery management councils, commercial entities, community groups, and state and territorial natural resource management agencies. These funds support conservation projects and scientific studies that benefit coral reef management across seven U.S. states and territories, the Caribbean, and the Pacific. For current funding opportunities, please refer to the Office for Coastal Management Funding Opportunities website. All projects focus on the three primary threats to coral reefs—global climate change, land-based sources of pollution, and unsustainable fishing practices—as well as priority coral reef regions and watersheds. State and Territorial Coral Reef Conservation Cooperative Agreements sustain coral reef management and monitoring in the states and territories of American Samoa, Commonwealth of the Northern Mariana Islands, Florida, Guam, Hawaii, Puerto Rico, and U.S. Virgin Islands. Fishery Management Council Coral Reef Conservation Cooperative Agreements support sustainable coral fisheries management in cooperation with regional fishery management councils. Domestic Coral Reef Conservation Grants address the three primary threats to coral reefs as well as emerging coral reef issues identified by local management agencies and partners. International Coral Reef Conservation Cooperative Agreements build local coral reef management capacity and support coral reef monitoring in priority international geographies. Non-governmental Organization (NGO) Partnership Coral Reef Conservation Cooperative Agreements provide funding to NGOs with specialized experience in supporting the ongoing coral reef conservation efforts of our state and territorial partners. The Coral Reef Conservation Fund, a competitive grant program administered on behalf of the NOAA Coral Reef Conservation Program by the National Fish and Wildlife Foundation (NFWF), implements a long standing public-private partnership that was created to support coral reef conservation projects both domestically and internationally.